The Swingline DM12-13 micro cut shredder is a tough shredder that offers non-stop jam free technology, delivering a hassle-free shredding experience. This paper shredder can shred up to 13 sheets per pass, creating micro cut particles of 1/8” x ½” at security level P-4. It offers continuous duty motor, effortlessly shredding at 15 ft./min. Swingline DM12-13 micro cut shredder is suitable for shredding confidential documents. It is a departmental shredder; shredding paper, staples, and paper clips. 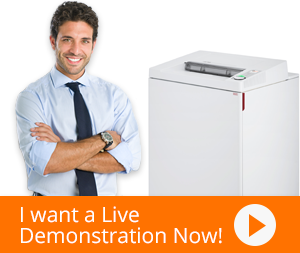 The shredder can handle large shred jobs using the advanced Jam Free technology and operates continuously without jams. Its light blinks when too much paper has been inserted; stopping shredding. It comes with thermal overload protection and reduces energy costs when it automatically places the shredder in sleep mode.Swingline DM12-13 shredder features a wire-frame waste bin; the bil full indicator blinks when the bin is full. To extend the blade’s life, it automatically oils the cutting blades. To achieve smooth shredding, it automatically cleans the cutting blades. An epitome of excellence, this shredder is surely the best solution for regular shredding projects.